After the horizon check, and a check of the VHF radio, the crew entered a code into P62 to tell the computer that they were about to lose the service module. The spacecraft was then yawed 45 degrees to the left to help the departing SM to avoid collision. Because the CM's thrusters could not impart translation motions, they could only cause rotations, the task of ensuring a sufficient separation distance was left to the SM. Jettisoning the service module was an intricate task left almost entirely to automatic systems that not only severed the CM/SM cables and pipes safely, but also ensured that the SM was moved well away. 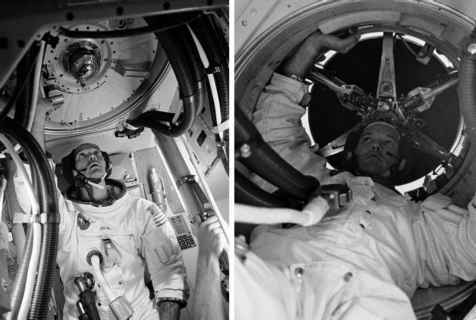 However, the SM was the primary source of power, oxygen and cooling, and inadvertently separating the two modules any earlier in the flight would have had disastrous consequences for the crew. Therefore, as with most other events that occurred only once yet demanded the highest reliability, the SECS took care of disconnecting the umbilical lines between the two modules, cutting the ties that held them together and controlling the SM's evasive manoeuvres, all of which occurred in just a few seconds. The process began when the CMP applied power to the logic circuits of the SECS and armed the pyrotechnic system, connecting dedicated batteries to their control circuits. After the arming sequence was complete, the flip of a switch began the separation sequence. As would be expected, this switch was guarded by a metal cover to avoid accidental operation. The SECS then assumed control. A command was sent to a controller box in the service module. This started a timer to trigger the RCS jets on the SM, ready to move the now unwanted hardware away from the CM after separation. Many systems on board the SM remained active to support the separation process. In particular, two fuel cells continued to supply power for the jettison controller and the thrusters, and to fire the pyrotechnics that severed the steel ties holding the CM and SM together. Electrical connections across the umbilical were carefully disconnected by an arrangement of cams and levers in the CM, powered by a small explosive charge that literally unplugged the cables between the two spacecraft before another pyrotechnic charge drove a guillotine through all the cables and plumbing that ran between them. Three strong tension ties that ran through the command module's heatshield were all that held the two modules together. On command from the SM's event controller, each was cut by two separate explosive charges allowing springs beneath each of six support pads to push the modules apart. As the service module came free, its controller fired its jets both to pull it away from the command module and impart a spin that attempted to stabilise its motion. Originally those thrusters that were working to pull it away continued firing until depletion or failure. However, early Apollo crews discovered that despite these efforts to take the SM well away from the CM, the complex dynamics of the remaining propellant in the tanks caused the departing SM to turn around and approach the CM again. During their debriefing, the Apollo 11 crew were asked if they saw their service module. This problem was cured by shorter separation burns. At this point, they were in a heads-down attitude with the lift vector up. With everything verified, the CMP pressed 'Proceed' on the DSKY, placing control of their attitude in the hands of the autopilot. Its display showed their impact coordinates and a check of their heads-up/down status at which point 'Proceed' was again pressed to pass control of the re-entry profile fully into the computer's hands.